MADISON, Wis. — Among the most egregious examples of Gov. 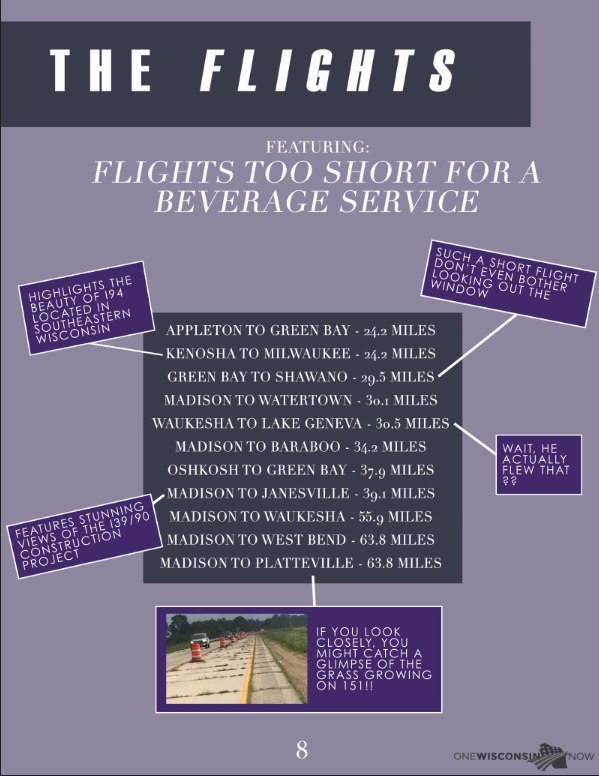 Scott Walker’s “serial misuse and abuse” of the taxpayer-funded state plane are the ridiculously short flights he took at times, charging taxpayers to fly he and his entourage distances as short as 24 miles from Appleton to Green Bay. After his disastrous run for president, Gov. Scott Walker admitted in an interview that he needed to rehabilitate his political image in Wisconsin to have a chance at continuing his 25-year political career. One Wisconsin Now’s investigation of state records reveals Walker’s use and abuse of taxpayer resources, deploying the state airplane for over 950 flights from September 21, 2015 through August 2018 at a cost in excess of $900,000, as he mounted his over two year long campaign to try to repair and rehabilitate his political image. Walker charged taxpayers $2,017 to fly the state plane to Rhinelander to film a campaign commercial. Records obtained show Walker’s office set up a bogus “official visit” weeks after setting up the campaign commercial filming locations. One WI Now has filed a request for criminal investigation with the Dane County District Attorney’s office and with the state election regulators. Walker had an empty state plane flown from Madison to Milwaukee to pick him up after a haircut and then fly him north to a National Rifle Association conference at a cost of $2,586. Walker flew the state plane from Madison to Green Bay and back on a Saturday to attend a funeral and did so in order to be able to attend a Badger football game at a cost of $1,755. Walker even took the short flight from Madison to West Bend in May 2017 so he could attend a “Walk With Walker” event in the area. He literally flew to take a walk, at a cost to taxpayers of $3,122 for that and the rest of his air travel that day. One Wisconsin Now’s full database of Scott Walker plane research is available here.